1. Hatha Yoga : 1 Class: 28 CHF -. 10 classes Abo. : 250 CHF-. 2. 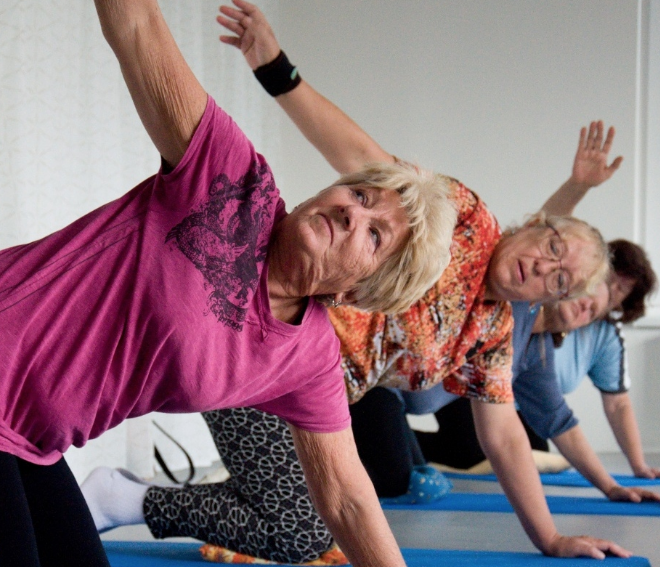 Wednesday morning Yoga & Seniors Yoga : 1 class 20 CHF-. , 10 classes Abo 180-. Traditional Hatha Yoga practice for beginners and intermediate levels, with 0-4 years experience with Yoga asanas. Pranayama, or Yogic breathing techniques are an integral part of this course. The course ideally requires the students to attend classes for 6-8 weeks regularly to effectively feel the benefits of Yoga practice. Cues and support will be offered to modify the postures according to individual needs of practitioners. Students can also make use of our little library at the center to enhance knowledge of Yoga philosophy and asana as well as pranayama practice. Morning Hatha Yoga practice including warm up with Sookshma Vyayama followed by Asanas and Pranayama. This practice is designed to energize you and to help keep your balance with mind, body and soul throughout the day. You feel fresh and light in your day after this practice. Cues and support will be offered to modify the postures according to individual needs of practitioners. This Yoga practice is designed to help loosen the stiff muscles, improve range of movement and motion in the joints to be less susceptible to chronic problems such as osteoporosis, arthritis and heart disease. Yoga for Seniors can help slow down the effects of the aging process by maintaining muscle softness and flexibility, keeping the mind alert and awake, encouraging relaxation and strengthening muscles and joints. Its multi-pronged approach can encourage the body, mind and spirit to remain healthy and strong while reducing the effects of many age-related issues. A private yoga session is specifically designed around your needs. From a range of therapeutic sessions for cancer patients in Rehab to individuals with particular nervous disorders, these Yoga sessions help to heal and energize. Non-therapeutic Private Yoga sessions designed around your needs are available upon your specific request. Normally these sessions are recommended to be organized at ArogaYoga school, however upon request and after speaking, these can also be organized at your place.